This is special, so special that you might be inspired in ways that surprise you! MYSTERY… Should we trust the fragrance industry with our loved ones health? We could buy products that are made by a self regulated industry that believes it’s ok to include many harmful chemicals (derived from petroleum and other fossil fuels) in their products (according to their member’s voluntary disclosure of over 3000 ingredients, which is as close to disclosure as they come) or we can show our love for each other by doing things that nurture long term health and well-being for each other and the planet we all depend on for life. The choice is ours once we know it exists. Just in case there’s still some doubts, as their marketing has, after all, been very effective, don’t you think? Choose life and love over profits! Be Aware. Show you care. This entry was posted in Air Quality, Environmental Health, Fragrance, Friendship and tagged allergies, asthma, Chemicals, Fragrance, hazardous air pollutants, indoor air quality, love, natural, petrochemicals, phthalates. Bookmark the permalink. TIME Magazine weighs in! “Spritz at your own risk.” ! May is international toxic injury awareness education and prevention month. Is it in your area? Go to mcsbeaconofhope.com for a great open letter/proclamation to send to your mayors, governor, etc. If you know of a better letter please let me know. I have asked my mayor for a reasonable accommodation of having 1th responders (fire police etc.) to be fragrance chemical free in writing. No response yet but i found out from an intern in his office that Northfield MN has gone chemical free 1th responders!!! When people tell me its to much to ask, how will we ever enforce it blah, blah, blah. I ask them What would you do if you were me? Or your child? There are a lot of places who have the Awareness Day (Week, or Month), it’s worth asking for. Give them time for their health and legal departments to go over and approve the requests first. Breathing is not optional. 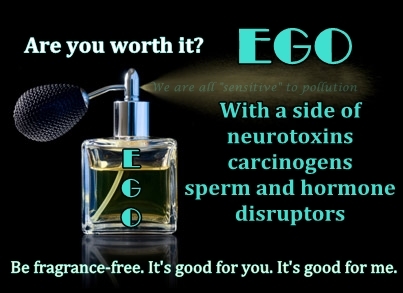 Toxic chemicals and fragrances are! They are not only harming those of us with MCS/ES who feel the effects before others (as the canaries did) but the chemicals are slowly harming everyone (think tobacco smoke – it’s not good for anyone to inhale or absorb).